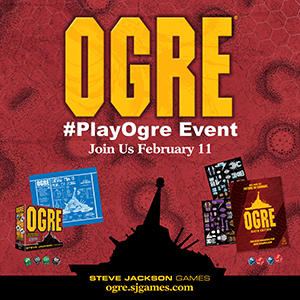 Steve Jackson Games has launched Organized Play support with Ogre Sixth Edition. Stores everywhere have received their Ogre Launch Kit, designed to showcase the new Ogre Sixth Edition and provide all the necessities for a great #PlayOgre Launch Event tomorrow, Saturday, February 11! What should you expect at a #PlayOgre Launch Event? To play Ogre, obviously! But that's not all. Each launch kit was filled with Ogre goodies like Uncommon Ogre Counter Sheets and Ogre Dice sets! So contact your friendly local game store to find out what it takes to walk away with the prize of your choice! To see if your favorite store has signed up, check our previous Daily Illuminator post. Don't forget to share pictures from your local event with the hashtag #PlayOgre and #PlaySJGames on Twitter, Facebook, and Instagram! Not only will we share them, you'll be entered to win great prizes the following Monday. #PlayOgre to prove you are the best! We'll see you today, February 11, at the #PlayOgre Event!